Broken flippers. Eye injuries. Oil-soaked feathers. Bites. Fungal infections. Molting problems. Starvation. These are just some of the problems—many of them life threatening—that penguins face. Luckily, there are places where they can be nursed back to health, including the Penguin Rescue Rehabilitation in New Zealand. There, volunteers work tirelessly to nurture sick and injured penguins and return them to their colonies. Your air conditioner experiences its own share of broken parts and “injuries” that compromise its efficiency, reliability and affordability. At Air Professionals, we take great pride in our ability to swoop in and rescue you from the problems that put your system on the disabled list and turn your cool, comfortable home into a sauna. 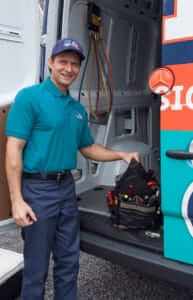 When you need our quality air conditioning repair service in Hillsborough, Bridgewater, Basking Ridge, Flemington, Frenchtown, Clinton or throughout Somerset, Hunterdon, Mercer, Morris or Warren counties, one of our cool techs will glide on over to handle the problem quickly and professionally. Our vans are loaded with everything we need to fix your problem the first time—every time. We have the experience, training and equipment to tackle anything you throw at us. It doesn’t matter what make or model your AC system is. We repair them all, including Armstrong, Coleman, Concord, Bryant, Carrier, Goodman, Lennox, Lux, Payne, Trane, Tempstar, York, and more! We’ll take your unit under our wing and nurse it back to health with our same-day repairs. We all lead busy lives. So, when you notice a minor problem with your air conditioner, it can be tempting to put it on ice. But here’s the reason why you should give your system the TLC it deserves as quickly as possible. Just like small health issues can slip into serious illnesses, minor glitches with your AC system can slide into major (and more costly) catastrophes. And that’s just not cool. Your unit is not cycling on or off. Your air isn’t as cold as it used to be, even when it’s on full blast. The flow of air through your vents is poor. Your vents are blowing out warm or hot air. One area of your home is cool; another is stuffy and uncomfortable. Water is dripping or leaking around or near your unit. Your AC system is making strange noises. Your system is giving off foul or strong odors. If you notice these or any other problems, it means your comfort could be slip sliding away. Don’t allow the cool comfort you deserve to drift out to sea. Whether you live in Hillsborough, Bridgewater, Basking Ridge, Flemington, Frenchtown, Clinton or throughout Somerset, Hunterdon, Mercer, Morris or Warren counties, Air Professionals will waddle on over and patch you up—good as new! Our techs are so cool that they’re not only certified by NATE (North American Technician Excellence), but also by ACCA (Air Conditioning Contractors of America). And that’s just the tip of the iceberg when it comes to their training and experience! Appointment scheduling: One of your feathered friends from Air Professionals will be in touch to confirm your appointment. Repair reminder: We’ll call to remind you 24 hours before your appointment. Call ahead: On the day of your appointment, your cool tech will call 30 minutes before coasting on over. Repair diagnosis: Your tech will listen to your concerns and issues. Equipment inspection: Your tech will perform a thorough inspection and find a solution. Before performing the repair, your tech will explain why your unit is on thin ice. He’ll answer all of your questions and make sure you’re on board. Air conditioning repair: Your tech will fix the problem to your complete satisfaction, putting your comfort back on solid ground. Repair warranty: You’ll receive a one-year warranty on all repairs. Unfortunately, there are situations when your system is too far-gone. No matter what tricks our techs have up their sleeves, some broken or aging systems simply can’t be rehabilitated. When that happens, Air Professionals is the experienced contractor you want on your side for superior air conditioning replacement or air conditioning installation. Is your system slip sliding away in the middle of the night or over the weekend? Try not to let it ruffle your feathers! Our team is available 24/7—all day, every day—for emergency repairs and service. Plus, we offer a 100 percent satisfaction guarantee on our top-shelf products and impeccable services. Of course, all of the cool kids know that the best way to prevent unexpected repairs is to count on your feathered friends at Air Professionals for reliable, affordable, money-saving tune-ups. To find out how we can keep your AC unit on course, check out our AC maintenance service. We aim to please! We will coast on over to handle all of your repair needs. Call Air Professionals today at 908.238.3732 or contact us on the web. Warm Up With Cool Savings! We’ve got plenty of deals that will melt your heart—and save you money.